And also of my second. And, okay, my third love too. It's not that I'm boy crazy. I remember when I first read this book, I was 13 and in the 8th grade. I had bought the book from one of those scholastic book orders. 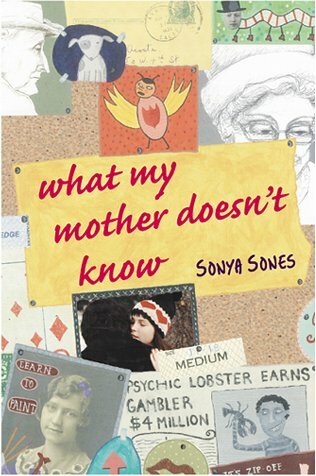 I read What My Mother Doesn't Know in one night and immediately passed it on to one of my friends. My copy made rounds through most of my friends and I never got it back. If that doesn't speak for this book, I don't know what will. Sophie's story is one that rings truth among us all. I think everyone has a little bit of her inside them - honestly, when I first read it, I remember thinking; "God, I'm not the only one". Sones does a remarkable job expressing feelings and thoughts that we all have had before. Sophie struggles with all the common issues; insecurity, popularity, peer pressure - but the author approaches it in such a unique way. The entire book is written in free verse and it reads as almost a diary. The plot line isn't earth shattering, but it's honest. I saw so much of myself in Sophie; she is incredibly easy to connect to. She is unsure of herself and often confused by her feelings; especially when it comes to the class geek, Murphy. Sophie wants to be his friend, but is worried about what everyone else would think. When everyone else leaves for Winter Break, Sophie and Murphy finally have time to form a friendship. They are practically inseparable for those two weeks, but what will happen when Sophie's friends come back? Now, what teenage girl doesn't deal with the frustration of peer pressure? I connected with and loved this book at 13, and now at 20 I still find myself in awe of it. The poetry is understated, raw and emotional. There are so many beautiful examples; but my favorite is Heading Home. Righter than anything ever has. See what I mean? Sones somehow manages to capture the spirit of youth and innocence in her poetry; it just transports you back in time. Sophie's story is exquisitely captured and told and will always have a place in my heart. It's a short book and a quick read, but definitely worth your time. If you haven't read this one yet, you are missing out.